Updated Friday, September 2; 10:58 am: William Gunn, Director of Scholarly Communications at Elsevier, posted on Twitter that the institution-specific ‘Find Full Text’ connection will soon be back on individual article pages on Mendeley Papers. Thank you, @MrGunn, for that quick assistance and positive outcome for our users. I’m working on a new article related to our scholarly workflow project — exploring the integration of library services within citation management software. In the article, I review the current level of library-centered connectivity for various tools — Endnote, Zotero, ReadCube, and Mendeley. ReadCube offers (in my opinion) the most visible integration, asking users to authenticate with their institutional login to retrieve the full text of article PDFs. ReadCube has also automated a portion of the institutional affiliation process within the software. They offer a list of institutions for the user to choose from; a choice will automatically populate ReadCube’s preferences with the user’s institutional OpenURL link. It’s wonderful that ReadCube offers these optimizations; it increases the chances that users will find the full text of their article via their library. Mendeley used to have some very nice library connectivity options as well. Those options are now gone. This Mendeley Blog article from 2011 details the library connection situated within Mendeley’s ‘Get Full Text’ options in the Mendeley catalog. In a nutshell, users can view the research catalog entry for a specific article. On the research catalog entry page, the article information was once accompanied by an option to retrieve the full-text of the article in several places, including Google Scholar and the user’s home institution. I taught this optimization countless times to students, and I know it helped them more readily connect with research articles. It ensured that my students did not land on unauthenticated journal web pages where they would be confronted with a price for a full text article. Get full text at journal is now the only path to an article in full text. I think the motivation behind this change is pretty clear, and it’s terrible. This change virtually ensures that a user will (more than likely searching from off campus and unauthenticated) land on a journal article page and see a fee as the only option to purchase a journal article. While an excellent product, Mendeley has taken a step backwards with this new change. Is it surprising that it happened? No. Selling journal articles to people who may already have access via their home institution is a shallow attempt at additional revenue. Building lasting connections and seamless integration with libraries and librarians would add depth to their product and ensure continued future adoption by students. Mendeley needs to do the right thing for their users and reinstate the ‘Get Full Text’ at your institution link. Note: This post was contributed by Eric Novotny, Acting Head of the Penn State’s Arts & Humanities Library, and History Librarian. Eric is one of the subject librarians participating in this project. As the library liaison to Penn State’s history department I was eager to examine historians’ responses to our Personal Scholarly Archiving Survey. With the invaluable aid of Alan Shay we isolated responses from forty scholars with historical research interests. Comparing these self-identified historians (who may or may not be in a history department) to the larger set of responses revealed some interesting findings. 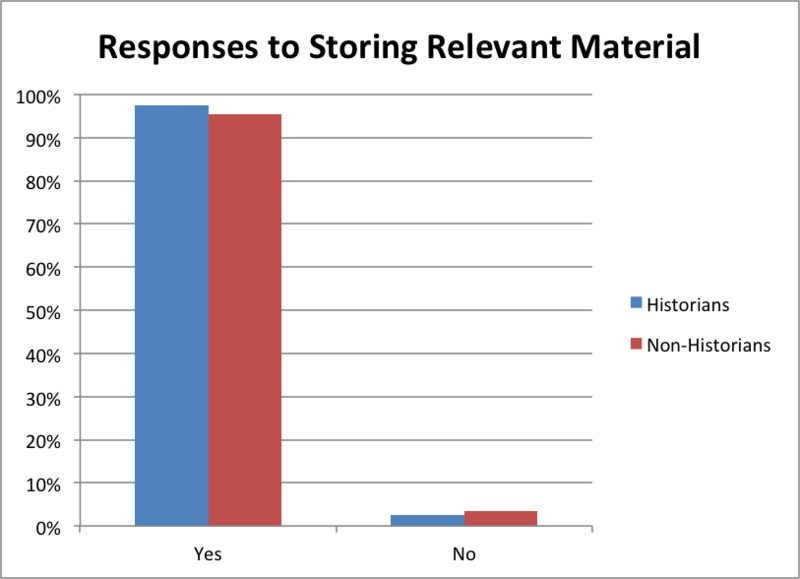 Not surprisingly, and like scholars in other disciplines, nearly all historians reported storing relevant research materials. Survey Question 7: Are you storing (on a computer or online) materials relevant to your research and work? The historians in our survey were less likely to use Cloud Storage (Dropbox, Google Drive), and also less likely to use citation software such as Zotero or Endnote. 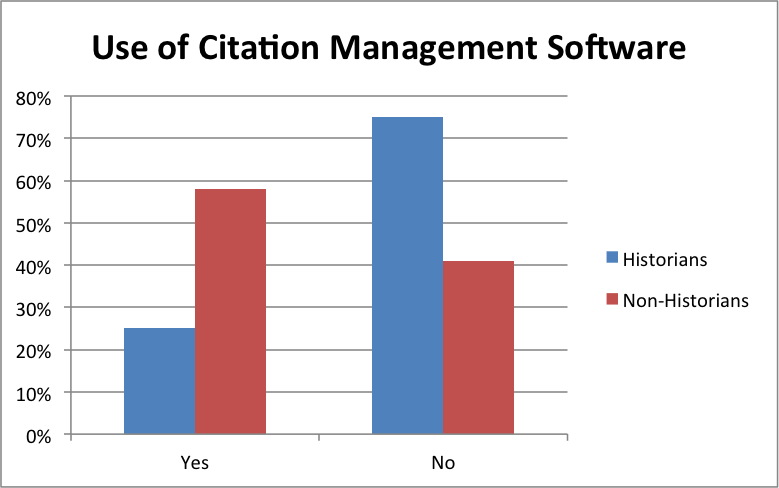 Survey Question 10: Do you use citation management software (Endnote, Mendeley, Refworks, Zotero, etc.) to create bibliographies and/or organize references? Survey Question 12: Do you use any software/online services for sharing your research articles/data with others? 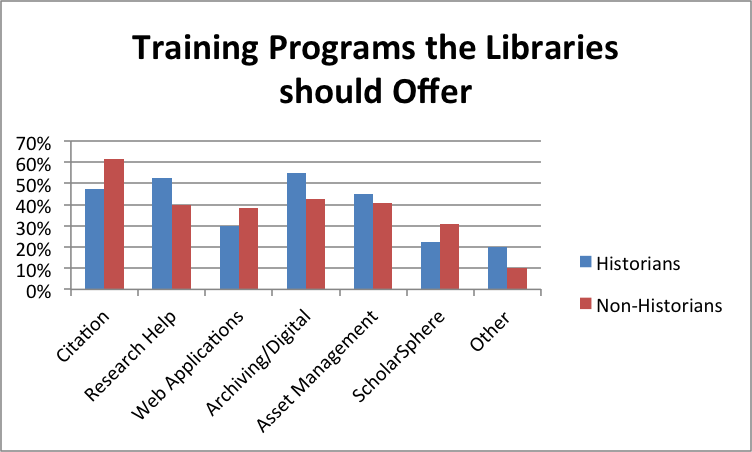 These findings present libraries with an opportunity. A significant percentage of respondents expressed a desire for training in the areas of citation management, personal archiving, and asset management. There is a role for librarians to play in highlighting the available productivity tools. There is also an advocacy role for libraries and librarians in spurring the creation of universal integrated solutions. Historians want tools that accommodate their unique needs, including support for citing unpublished primary sources. They want a seamless transition from source gathering to note-taking and writing[i]. The project team is planning to conduct focus group interviews this summer to further identify the needs of historians and will share our additional findings.